At some point in time, everyone comes across an antique or piece of property which they want to restore to its original beauty. Standing in the way of full enjoyment of the item are years and layers of corrosion, paint, rust, and dirt. One the one hand, you can spend hours scouring the surface of your possession with sandpaper or steel wool. On the other, you can contact a professional for custom sandblasting in New Jersey for a remarkable alternative. At J&R Sandblasting, our New Jersey sandblasting company is here to help you with any restoration project that you have in mind. We can save you hours of toil and frustration. Better yet, through our sandblasting services, we can beautify and protect your prized possession in the best possible manner. Call J&R Sandblasting today if you need to hire a professional sandblasting company in New Jersey. Our courteous and polite staff would be happy to take your call. Our sandblasting experts can answer any questions that you may have about your restoration project or our exceptional line of services. We can schedule your appointment today. Generally speaking, sandblasting is a an amazingly efficient and effective means to clean wood, masonry, metal, and plastic surfaces. If conducted in the correct manner, it is nondestructive. After the sandblasting occurs, the surface that was treated will be ready for any paint, sealant, or primer application. At J&R Sandblasting, our professionals will customize our sandblasting restoration services to your unique needs. In this way, we can guarantee the best possible results. You will be completely satisfied with the renewed beauty of your antique property. The primary way in which our professionals will customize our services to you is by choosing the best medium for your unique project. Sandblasting in New Jersey is an all inclusive term that covers any process by which particulate matter is shot via high pressured jets of air at a surface to be cleaned. Depending on the type of corrosion to be lifted and the delicacy of the underlying surface, different cleaning media should be used. Our professionals know exactly what material works best for each task. 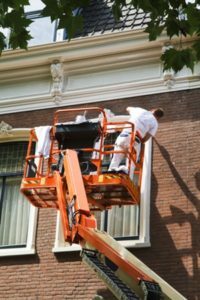 When you hire our professionals for your restoration project, you can rest assured knowing that we will use the best media blasting process and materials for your needs. We will work our hardest to achieve your complete and total satisfaction. If you need to hire a professional for customized sandblasting in New Jersey, call J&R Sandblasting today at 201-832-0995, or fill out our online request form.